There’s a special place in my heart for the annual Cannes festival. As the aptly proclaimed “home of creativity,” Cannes embodies the very same principles around which we’ve built JustPremium for the past five years. We believe that creativity should be celebrated and elevated within our industry, and we know how hard the people in our industry work day in and day out. They deserve an occasion to let their hair down and have some fun—all while building the valuable relationships that drive our industry forward every day. That’s why, when JustPremium heads to Cannes, we like to do something a little outside of the ordinary. While I love extravagant yacht parties—complete with deejays and bottles of rosé—just as much as the next person, that old staple Cannes experience just doesn’t quite fit with the spirit of JustPremium. For one, as a young and rapidly growing company, we believe that our biggest investments must remain focused on constant innovation within our product and service. But perhaps more importantly, JustPremium isn’t the type of company that does things the way that everyone else does them. At JustPremium, we believe in creativity, visibility, and just the right amount of fun and irreverence. 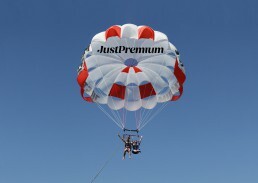 That’s why, as we did last year at Cannes, JustPremium will be foregoing the overly lavish yacht and giving a whole new meaning to the term “brand uplift” by sweeping our guests into the sky for a premium parasail experience, along with other watersports activities. And we’d like to invite you, our valued clients and partners, to be a part of this truly memorable experience. Consider it our way of rising above the noise at Cannes—both literally and figuratively. If you’re coming to Cannes, I’d like to extend my personal invitation to come fly high with JustPremium from June 18-21. You can RSVP here and we’ll see you at the beach! London, March 2018: Programmatic rich media and video ad marketplace, JustPremium, has today announced that it has recruited two new teams. This follows the closure of digital marketing company Undertone’s office in Germany, and the scale back in the UK market. The announcement will also see the opening of the second JustPremium office in Hamburg, Germany as an additional to the existing operation in Dusseldorf, allowing it to efficiently service this large market. The expertise of the new recruits will complement JustPremium’s existing offering and will allow it to further cement its position in Europe, and establish itself as a leader in digital creativity and programmatic rich media. The team included five new employees in Germany who has taken the role of UK Managing Director and Germany Country Manager Joerg Schneider. This news takes the JustPremium team to over 110 employees globally and position itself as the go-to company in Europe for brand-safe rich media and video advertising solutions for both brand advertisers and premium publishers. Eric Visser, Founder and CEO at JustPremium commented: “We’re delighted to have a hugely talented group of people join our team, reflecting the momentum of Justpremium’s growth globally. JustPremium is a scale up, but historically we have been one of the few players in rich media, and this move positions us as the undisputed leader in this sector. We’re on a mission to prove that the legacy ad tech giant can be challenged by both startups and scaleups with the right balance of innovation and creativity. JustPremium is the world’s first programmatic Rich Media Ad Marketplace, offering a comprehensive managed service from creating to delivering brand experiences. The service allows brands and agencies to access premium inventory, available on the web and on mobile, through programmatic buy. Publishers work with JustPremium to create additional advertising inventory and monetise it through its marketplace. JustPremium’s rich media and video advertising solutions encompass a series of rich media ad units surrounding media content. As a member of the Coalition for Better Ads, JustPremium is committed to helping shape best practice online advertising standards. Recently, the company was nominated for the Deloitte Fast50, which recognises the 50 fastest growing technology companies based in the Netherlands. To boost its presence in APAC and bring innovative ad products to more publishers and advertisers in the region, JustPremium BV, the world’s first programmatic rich-media marketplace, has signed a deal with ABN AMRO Bank NV. Established in 2012, JustPremium connects advertisers with 3,000-plus premium publishers in 25 countries. With its headquarters in Amsterdam, JustPremium currently has offices throughout Europe and North America. ABM AMRO’s €1.5 million (US$1.7 million) funding will enable JustPremium to establish a physical presence in the region, starting with offices in Japan and Singapore in 2018. It will also help develop JustPremium’s technology so that it meets the demands of APAC’s marketers and publishers. The time is right for JustPremium to invest in Asia-Pacific as the region’s ad spend is projected to climb USD$30 billion between 2016 and 2019, accounting for 33% of the global figure by 2019, compared to 32% in 2016. “It marks the first time the region will contribute more than a third of the world’s ad spend; although, it would still be smaller than the North American ad market, which accounts for 36%. However, the gap between the two regions is narrowing”, according to Zenith’s latest advertising expenditure forecasts. How Creativity Can Survive on a Mobile Screen?